They have amazing heat and drought tolerating capacity. They are easy to grow and requires less attention. Plants are grown for its attractive flowers & foliage with vibrant colours such as red, white, rose and pink. Introduction and Uses:Vinca is a hardy perennial plant with bright green, smooth oblong leaves. The flowers are rosy purple or white, the latter with or without a tiny reddish eye. The plants are free flowering and bloom throughout the year. The plants grow like weeds in various parts of the country. Vinca is an excellent potted plants. It can be grown in outdoor flower beds and borders. The plant has anticancer medicinal properties. 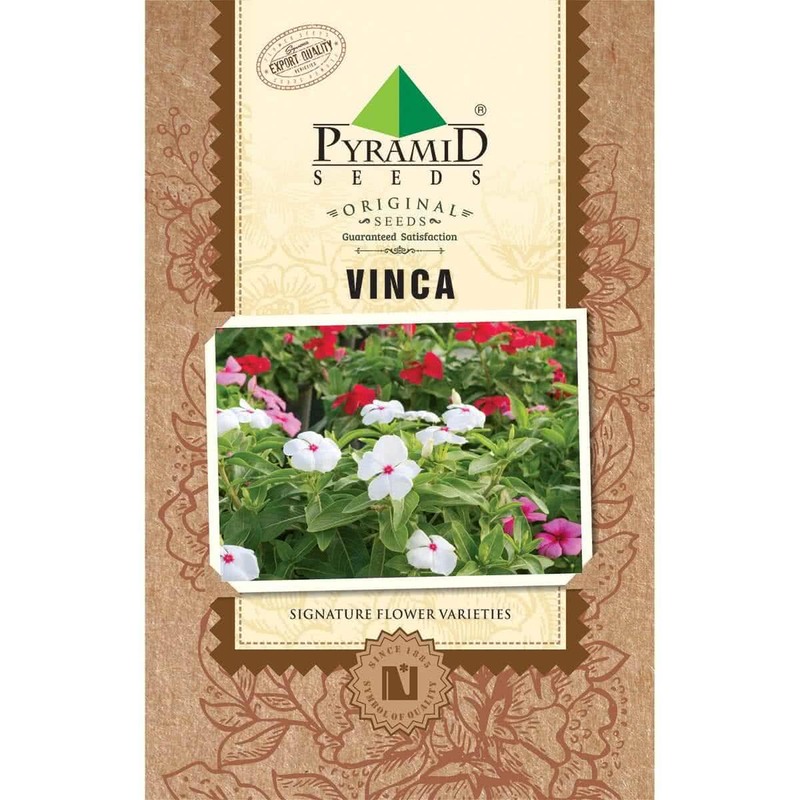 Vinca is grown by direct seed sowing in pots, containers, and flower beds. Seeds can be sown throughout the year. Seeds are sown 0.5 cm deep and are covered with a fine layer of soil. Immediately after sowing the seeds, a fine rose-can is used for watering. Extra, overcrowded seedlings can be thinned out after three weeks. Seeds can also be sown in seedling trays and transplanted after a month in pots and flower beds. Planting Distance: The spacing recommended is 30-45 cm. Plants can be grown in planters, containers, and pots of any size above 20 cm. Watering: Ground plants are watered once a week. Potted plants are watered every alternate day. 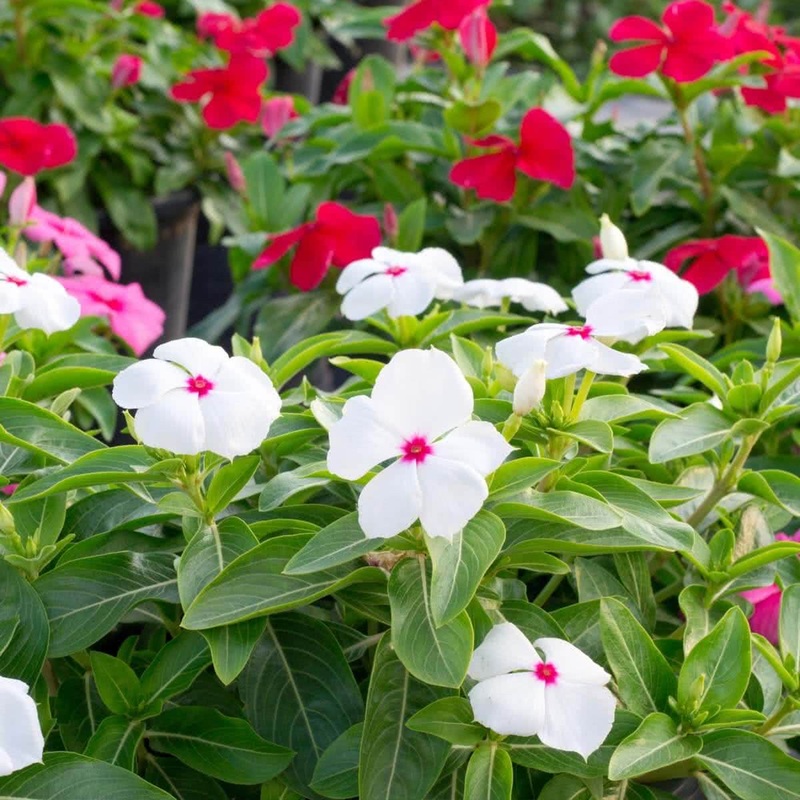 Feeding: Vinca plants can grow in any soil and not demanding about fertilizers and manures. Plant care: These are hardy plants that don't catch too many diseases. Click here to buy plant care products online in India. Bloom time: 1.5 to 2 months. Buy variety of flower seeds online. Regeneration: Plant is headed back every six months and replaced every second year.